KINSHASA Tens of thousands of Congolese demonstrators chanting anti-government slogans and waving opposition flags rallied in the capital on Sunday to demand President Joseph Kabila step down when his mandate ends in November. Kabila, 45, who has been in power since his father was assassinated in 2001, is under pressure at home and from increasingly exasperated world powers to step aside and call elections to choose a successor. 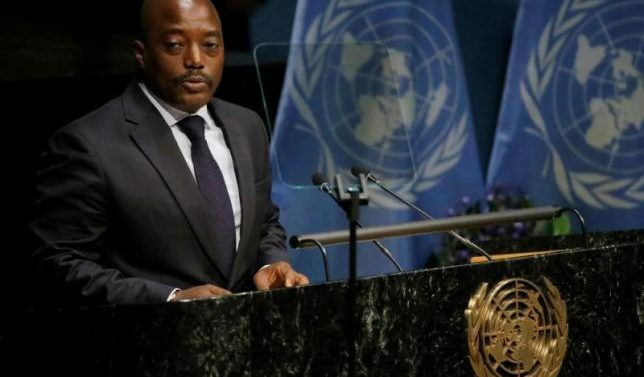 Kabila’s government has said logistical problems are likely to delay the poll and his supporters have suggested a referendum scrapping term limits so he can run again, as several other African leaders have done. He retains a solid level of support. His opponents, however, suspect Kabila is simply trying to cling on to power. “We’re sick of Kabila,” Philippe Lukusa, 35, who like many urban Congolese is unemployed, said as demonstrators sounded motorcycle horns and sang anti-Kabila songs during Sunday’s rally close to the parliament building in the capital’s Kasavubu neighborhood. Opposition backers like Lukusa are pinning their hopes on octogenarian coalition leader Etienne Tshisekedi. Tshisekedi’s supporters filled the streets for miles along the main airport road on Thursday when he returned to Congo after spending almost two years receiving unspecified medical treatment in Belgium. Tshisekedi, 83, has been visibly frail in public appearances. Reflecting Kabila’s persistent popularity among many of Congo’s nearly 68 million people, tens of thousands of government loyalists held a counter-demonstration a day after Tshisekedi’s return, calling for the president to stay on. Protests against a potential poll delay have in the past turned violent and authorities arrested dozens of critics of Kabila in April, although last week’s rallies were peaceful. A regional war between 1996 and 2003 in east Congo — a treasure trove of rare metals used in phones and other gadgets — killed millions of people, spawned countless militias and sucked in soldiers from half-a-dozen African countries. Sunday’s protest was still peaceful by 2.30 p.m. (1330) GMT, watched by armoured police trucks. Some of those gathered said they would try to force Kabila out if necessary. “We want Kabila’s immediate resignation. If he uses force, we will respond with force,” said David Slim, 24, a trader.